The materials and other information provided by the National Allergy Strategy website are for educational, communication and information purposes only and are not intended to replace or constitute medical advice or treatments. The National Allergy Strategy website intends that the information contained in this site to be accurate. Public education materials contained in this site have been reviewed and approved by the National Allergy Strategy members, including those on the ASCIA Education Committee. However, errors sometimes occur. Therefore, the National Allergy Strategy disclaims any warranty of any kind, whether express or implied, as to any matter whatsoever relating to this service, including without limitation merchantability or fitness for any particular purpose. In no event shall the National Allergy Strategy be liable for any indirect, special, incidental or consequential damages arising out of any use of or reliance on any content or materials contained herein. The National Allergy Strategy does not assume and hereby disclaims any and all liability to any person or entity for any claims, damages, liability or other loss including, without limitation, any liability for injury or other damage resulting from any use of or reliance on this service, or from the posting of any content or material by any third party. No use of, or reliance on, any materials included in this site shall be deemed to give rise to a medical practitioner-patient relationship. No material included in this site shall be deemed to present the only or necessarily the best method or procedure with respect to a matter discussed on this service; rather, any such material shall be acknowledged as only the approach or opinion of the discussant. The user assumes all risks of using the materials included in this site. The website is for use by the general public and health professionals. The health information content provided on this website is developed by the National Allergy Strategy stakeholder organisations who are medical and allied health professionals. The health information presented such as guidelines and educational materials are based on current medical knowledge and practice as at the date of publication. Information for this website is developed and approved by the National Allergy Strategy. Copyrights to the materials included in this site are owned solely by the the National Allergy Strategy, except for materials which are created by others (or the copyright to which is otherwise owned by others) and for which a copyright notice is posted adjacent to such content or materials. The copyright to each item of material created or otherwise owned by another is owned by such creator or other owner. None of the materials included in this site may be reproduced in any form without the express written permission of the National Allergy Strategy, the creator or other owner, as the case may be. 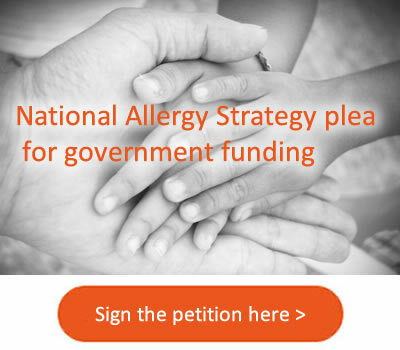 In this regard, the graphic images and layout of this site are the exclusive property of the National Allergy Strategy and may not be copied, distributed or displayed except using an HTML browser or as otherwise stated herein, without the express written permission of the National Allergy Strategy. Permission is hereby granted to (1) print copies of the materials for which the National Allergy Strategy holds the copyright, for personal and non-commercial use and only for informational purposes. Except as stated herein, no portion of the materials included in this site may be reproduced or transmitted in any form by any means, whether by electronic, mechanical, photocopying, recording or otherwise, without the written permission of the National Allergy Strategy.